This is a little adaptation of a DESIGN I did a while back - I was going to scrap the pattern altogether as it just was not working for me - but then inspiration struck. I changed a few rows, made it a bit smaller and VOILA!! Although I used DK cottons for all the doilies the different brands differ quite a bit in thickness - so adjust your hook size to suit your yarn. Special thanks to Erica Liebenberg for testing this pattern for me (with absolute lightening speed!!!) - As you can see kitty cat was quite impressed with the yarny goings on! 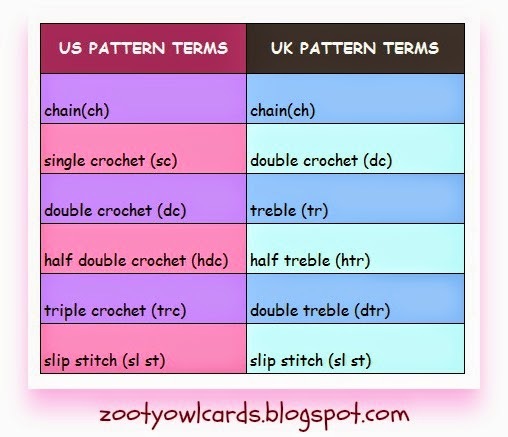 I have included this little chart to make it easier for my UK readers to reference the difference in stitch terms. Row 2: Join yarn in any 1ch sp; 6ch (counts as 1dc, 3ch); (1dc into next 1ch sp, 3ch) x 11, sl st into 3rd of 6ch at start to close. Row 3: Join yarn in any 3ch space; 2ch, 3dc (4dc cluster) 6ch; (4dc cluster into next 3ch space, 6ch) x 11; sl st into top of 1st cluster to close. Row 4: Join yarn in any 6ch space; 1ch (counts as 1sc); [12 dc into next 6ch sp (12dc group); 1sc into next 6ch sp] x5; 12dc into last 6ch space; sl st into 1 ch at start to close. Row 5: Join yarn into top of 2nd dc on any 12dc group; 4ch in same sp as join (counts as 1dc, 1ch); 1dc, 1ch into each of next 9dc (10dc group); (1dc into 2nd dc on next 12dc group, 1ch; 1dc, 1ch into each of next 9dc) x 5; sl st into 3rd of 4ch at start to close. Row 6: Join yarn into top of 2nd dc on any 10dc group; 5ch in same sp as join (counts as 1dc, 2ch); 1dc, 2ch into each of next 7dc (8dc group); (1dc into 2nd dc on next 10dc group, 2ch; 1dc, 2ch into each of next 7dc) x 5; sl st into 3rd of 5ch at start to close. Row 7: Join yarn in first 2 ch sp of 8dc group, 5ch in same space (counts as 1sc, 4ch), 1sc, 4ch into each of next six 2ch spaces (6 loop grouping); (1sc, 4ch into first 2ch sp of 8dc group; 1sc, 4ch into each of next six 2ch spaces) x 5; sl st into 1st of 5ch at start to close. Row 8: Join yarn in first 4ch space of any 6 loop grouping; 5ch in same space (counts as 1sc, 4ch); 1sc, 4ch into each of next four spaces; 1sc into next 4ch sp, (5 loop grouping) 6ch; [1sc into first 4ch space on next 6 loop grouping, 4ch; 1sc, 4ch into each of next four 4ch sps; 1sc into next 4ch sp, (5 loop grouping) 6ch] x 5; sl st into 1st of 5ch at start to close. Row 10: Join yarn in first 4ch of any 4 loop grouping; 5ch in same space (counts as 1sc, 4ch); 1sc, 4ch into each of next two 4ch spaces; 1sc into next 4ch space (3 loop grouping), 1ch; [into 2ch sp between 1st and 2nd 2dc clusters work one 2dc cluster, 2ch; into 2ch sp between 2nd and 3rd 2dc cluster work (2dc cluster, 2ch) x 3; into 2ch sp between 3rd and 4th 2dc clusters work one 2dc cluster, 1 ch; 1sc into first 4ch of 4 loop grouping, 4ch; 1sc, 4ch into each of next two 4ch spaces; 1sc into next 4ch sp (3 loop grouping), 1ch] x5; into 2ch sp between 1st and 2nd 2dc clusters work one 2dc cluster 2ch; into 2ch sp between 2nd and 3rd 2dc cluster work (2dc cluster, 2ch) x 3; into 2ch sp between 3rd and 4th 2dc clusters work 1 2dc cluster, 1 ch, sl st into 1st of 5ch a start to close. Wonderful, can't wait to try it. Thank you for sharing with us. Absoluty fabulous !! I love them !! Thanks a lot for the pattern !! Have a good day !! still happy to read a crochet pattern. Thanks Anita! It is a lovely, rewarding feeling when you make something pretty! Keep it up! Hi Mally! It is a cotton, pan fibre, coffee extract blend. I only heard about it recently. I purchase it here in South Africa but I suspect it is an imported brand - it says "barbara" on the packaging too - I did google it but the search did not turn up anything worthwhile! wonderful work, I love it! thank you for the Tutorial. You know I love your patterns !! And ... looking at these mandala ones again ... I had a thought. What beautiful hats they would make .. if we could pull them in at the correct round ... Now I am not great at all at inventing crochet things .. but this is your talent! I wonder .... whether this might inspire you to make some hats out of your mandala patterns one day when you are 'bored'? If you do .. I am sure a LOT of us will thank you just as you made the Road Trip Scarf that has gone viral too ! Thank you so much for your beautiful work, and your generosity in letting us have these patterns free too ! 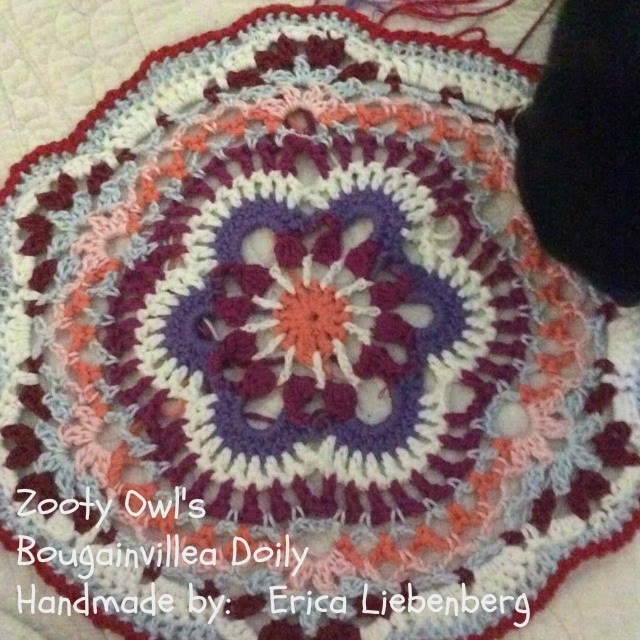 I actually did make a beanie with the Mandala part of the Zooty Owl Trivet. Turned out quite "cool" according to my daughter! Will post a little pattern for it soon! Beautiful pattern. I'm going to try to adapt it to double yarn and s larger hook to make a bathroom rug.